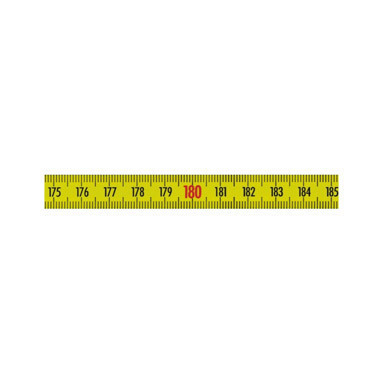 Flat, steel self adhesive tape measure. Duplex scale - reads left to right. Graduated on both edges in mm, with continuous cm highlighted in red at every decimetre. Short lengths of blank tape before and after graduations. Tape can be cut to required length by user. Self-adhesive backing is protected by plastic tape, which is peeled off before affixing. Made by Richter of Germany.